Tom Thumb, Green Thumb all I know is I’m all thumbs when it comes to gardening. In my house I have exactly 2 plants…that are still alive. I’ve been told it is impossible to kill a Christmas cactus…well I’ve just completed losing #4. Out back I have a “garden” and I use that term very loosely since we refer to it as the weed bed. So, I’d be the last person in the world you’d expect to want to visit the famous Keukenhof gardens in Holland. Yet somehow it was on my bucket list – go figure! So, this spring we set off with a few great friends to visit the Netherlands (okay so we got the men to go because we included Belgium and you all know how good their beer is) and on the itinerary was a visit to the famous Keukenhof gardens. Keukenhof gardens is open only mid-March to Mid-May and our trip was timed right for the tulips to be in bloom. We had to decide, full day or half day visit….OMG, we did the full day and still did not see everything so if you are even in that quandary….go full day for sure. Miles and miles of tulips (well 32 hectares to be exact), every shape and color you can imagine. Throw in some daffodils and hyacinth and you have a color mania of flowers. But it’s not all just flowers, there are activities in the park like boat rides, cycle paths, fun signs and wooden shoes to put your face and feet into for that ultimate photo op. Definitely climb the windmill to get a bird’s eye view of the vast tulip gardens. If you are taking the kids, then be sure to download the treasure hunt before you go. Ah yes, a full day at Keukenhof gardens will inspire you…I promise. How do I know this you ask….well I left the gardens that day 300 or so tulip bulbs heavier (or shall I say $300 or so lighter since the tulips were to be shipped to the US in the fall). Yes, me the ultimate weed bed owner left the proud owner of lots of tulip bulbs without one single plan for what I’d do with them. They arrived this fall and I am happy to say they are all planted into a brand new flower garden…now we just wait till spring. I’ll keep you posted but in the meantime, put Keukenhof gardens on your bucket list, you won’t be sorry. It was beautiful! This entry was posted in Europe, Group Travel, netherlands, River Cruise, Travel and tagged dutch, garden, keukenhof, the netherlands, tulips on November 29, 2017 by Sue - GetAway Travel Service. Have you ever taken a European river cruise? Have you ever cruised with Uniworld Boutique River Cruises? Our customers love to cruise on Uniworld. In fact it has one of the highest rates for repeat trips amongst all the suppliers we use. You may very well ask why that is. Well for starters, the standards of accommodations, food and service are extremely high. The ships have very tasteful interiors and yes they are all different, with each being as unique as your voyage. Typical cruise lengths are 8 – 15 days and everything is included, making for carefree and truly effortless travel. Included are: scheduled airport transfers, all dining on board, unlimited beverages (including many premium spirits), personalized shore excursions, fitness center, Wi-Fi, on-board entertainment and all gratuities. OK – is this a commercial? Yes it pretty much is and here is why. We currently have some very special amazing prices on select Uniworld Cruises including our group cruise in April 2017 from Amsterdam to Antwerp. This “Tulips and Windmills” cruise is scheduled to coincide perfectly with a visit to the famous Keukenhof gardens which has over 7 million bulbs in bloom each spring. Additionally we will visit the windmills of Kinderdijk, the picture perfect villages of Veere, Hoorn and Enkhuizen, and the cities of Amsterdam, Rotterdam, Bruges and Antwerp. So much to see and so much to do but you need to act fast. Why? Because our amazing special pricing only lasts until October 11. Give us a call at 262.538.2140 to reserve your spot with our group. For additional details on the ship and the trip you may also want to visit our web page. This entry was posted in All-Inlcusive, Belgium, Cruising, Europe, Food, Group Travel, netherlands, River Cruise, River Cruising, Travel and tagged amsterdam, bruges, keukenhof, tulips, windmills on October 1, 2016 by Paul - GetAway Travel Service. We have 2 exciting European Group GetAways scheduled for 2017. They may both be cruises, but they are completely different! First up is the Wines of Western Europe which includes Bordeaux (France), Basque (Spain) and Portugal. Our group will be sailing aboard the luxurious Azamara Journey. Azamara Club Cruises is at the crossroads of where luxury and destination immersive cruising meet. This ship only holds 694 passengers and has a wonderful mix of amenities. She’s a perfect-sized vessel: small enough that it’s never too far from one place to another, yet large enough to provide variety on long itineraries. On our trip we will experience late evening and overnight port stays. The Journey was completely refurbished in 2016 – it received new spa suites in the fully renovated Sanctum spa with updated decor in marble, light wood and a cream palate. Every suite and stateroom has new beds with the same decor scheme, and the restaurants also received a modern upgrade. Our 12 Night GetAway begins in Southampton England on September 4 and ends in Lisbon Portugal on September 16. Along the way you will experience the worlds foremost wine region in Bordeaux, spend a day at the Guggenheim museum in Bilbao, wash Tapas down with Rioja wine, and sip port in the Douro Valley – and so much more. You can find more details at our website. We hope you can join us. Our second European Group GetAway for 2017 is in December. Why December? Christmas Markets! Come with us and celebrate the season as we cruise along the Danube aboard the Uniworld SS Maria Theresa. We last visited Christmas markets in 2014 and everyone had such a great time that we knew we’d definitely do it again. If you’re tired of commercialism taking over the holidays, you will be very pleased with the traditions and romance of real Christmas markets where the gifts are not mass-produced but craftwork of real quality. Our group will begin in Budapest and sail along the Danube while visiting Hungary, Slovakia, Austria and Germany. Every stop along the way will feature special Christmas Market excursions. You can find more details on the itinerary at our website. Every Uniworld ship is as unique as it’s itinerary and the SS Maria Theresa is no exception. It’s opulent 18th century décor is a floating homage to one of the Habsburg empires most beloved ruler. The food, drink and service on Uniworld are absolutely outstanding – and everything is included! Call now as there are limited time promotions where even the air is included! This entry was posted in All-Inlcusive, Cruising, Europe, France, Germany, Group Travel, Portugal, River Cruise, River Cruising, Spain, Travel, Wine and tagged Christmas, getaway, getaway travel, River Cruise, traditional Christmas markets, Travel, wine on July 20, 2016 by Paul - GetAway Travel Service. European vacations continue to hold great value. The US Dollar remains at historic low levels vs. the Euro. This is good news for travelers to Europe as you definitely get more bang for your buck. Our best advice for Europe is to plan ahead – this is not a destination that typically rewards the last-minute traveler. The best way to start planning your European vacation is to schedule a consultation with Sue. River Cruising continues to grow and for very good reasons. Our clients absolutely love to take River Cruises. All it takes is to try it once and you will rave about it forever. Be aware however that not all river cruise companies are equal. You can research endlessly on your own, or you can call us to discuss. Our goal is to find out about what you want to do, how adventurous you are, what you like and what you don’t like. What are your travel dreams? Our recommendations are simply based on you and your needs, that’s it. All Inclusive vacations will remain hot, hot, hot. The industry continues to upgrade old properties and build new ones. There are All-Inclusives for all tastes and budgets. Well we know you want a warm weather, beach destination, but are you looking for a romantic escape or a family/multi-generational getaway? Do you want basic dining choices or a more gourmet experience? How does a canopy covered bed and open air shower sound? Or a private plunge pool within mere steps of your suite? The choices go on and on. We can help narrow it down to something you will love. According to the experts, air ticket prices are down but add-on fees are up. The simple fact, is you need air tickets to get to many vacation destinations. They are the transportation, not the vacation. Cheap will remain, well….cheap. While the dictionary defines cheap as inexpensive, it also defines it as something of poor quality or shoddy. Continue to be cautious about anything advertised as cheap, supercheap, ultracheap, etc. A fantastically cheap vacation is not a good value if it is actually craptastic (this is our official industry word for cheap vacations!). Everyone wants good value and that’s where we help – get the best value for your money that actually gets the vacation experience you are looking for. Will it be cheap? We certainly hope not. The best things in travel continue to come to those who plan ahead. For example, how about planning 2017? You may not be ready yet, but we are. 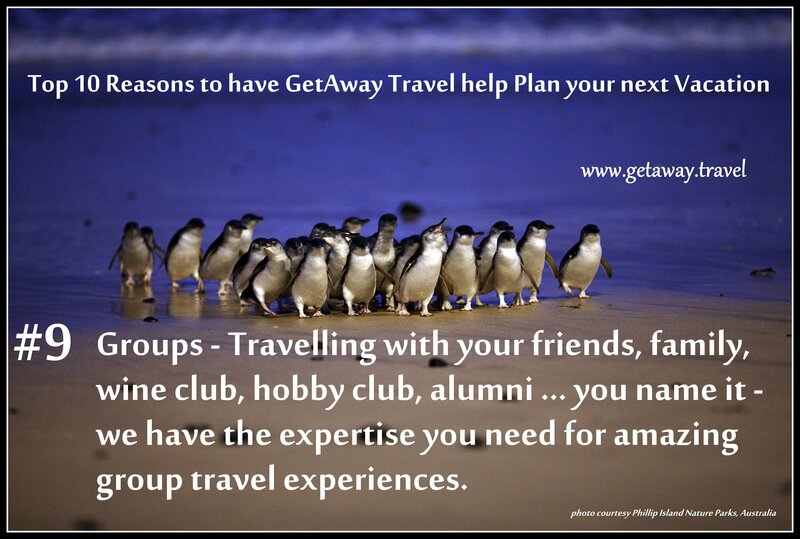 We have 2 special group options worth considering. Join us in January 2017 for our GetAway on the Getaway. We will do all the following: go down the highest water slides at sea, attend award-winning Broadway shows, experience Iron Chef dining, walk the plank and be endlessly entertained and pampered. Book now and choose between Free unlimited drinks, Free Specialty Dining, Free Shore Excursions or Free WiFi. In September 2017 we will be hosting a very special Wines of Western Europe group on the Azamara Journey. Beginning in England, we will sail to France, Spain and Portugal. Azamara specializes in unique itineraries that include overnight stays in many ports. Our group will be in Bordeaux, one of the world’s foremost wine regions for 3 days. But that is not the only World Heritage region we will visit – see our web page for all the details. This entry was posted in All-Inlcusive, Cancun, Cruising, Europe, Food, France, Group Travel, Mexico, Ocean Cruise, Portugal, River Cruise, River Cruising, Riviera Maya, Spain, Travel, Travel Agent, Wine and tagged azamara, getaway, getaway travel, Travel, Uniworld, wine, winery on January 18, 2016 by Paul - GetAway Travel Service. We recently returned from an unforgettable cruise along the Rhine River to visit Christmas Markets in Germany, France and Switzerland. Our journey was even more memorable as we travelled with a group of close friends. River cruising provides an up close and personal experience. The ships typically dock in the heart of town allowing easy and convenient access to the local sights and sounds. This is especially convenient for a Christmas Market Cruise. During the advent season, towns throughout Europe host wonderfully decorated markets for crafts, drink and food! Hop off the ship to go shopping all day and then back on in time for cocktail hour and a gourmet dinner before you set off for your next stop. This entry was posted in Cruising, Europe, France, Germany, Holidays, River Cruise, Switzerland, Travel, Travel Agent and tagged Christmas, Christmas Markets, traditional Christmas markets on December 13, 2014 by Paul - GetAway Travel Service. European Christmas Markets – Let’s GO! Advent has been ushered in since the late middle ages via traditional Christmas markets. Depending on where you are in Europe a Christmas market is also known as Christkindlmarkt, Marché de Noël, Christkindlesmarkt, and Weihnachtsmarkt. Christkindlesmarkt literally translates as “Christ child market”. Generally held in town squares, the markets sell food, drink and seasonal crafts from open-air stalls accompanied by traditional singing and dancing. Popular attractions include a Nativity scene, nutcrackers, toasted almonds, traditional gingerbread cookies and hot mulled wine to help stave off the cold winter air. Many handmade items including toys, decorations and ornaments are found in the Market. Check out this photo – It’s truly a magical experience! 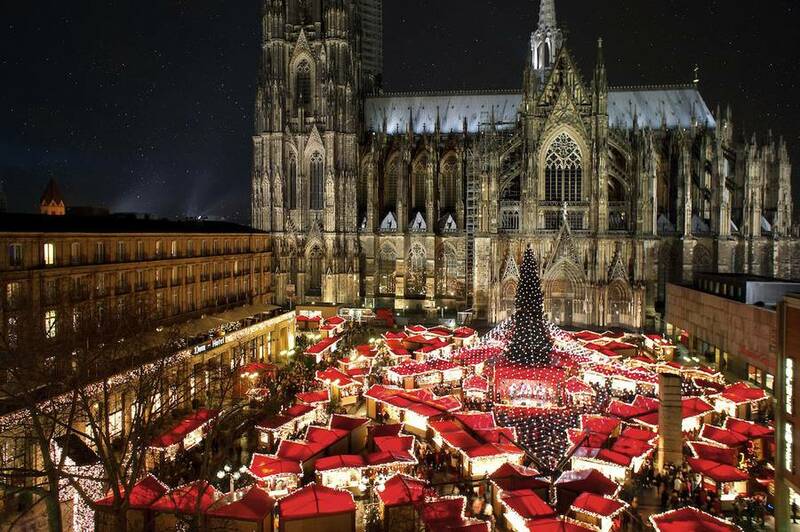 One of the most visited Christmas Markets is found in Cologne, Germany which in fact has 7 markets in total of which the 4 biggest are located near the amazing Cathedral. The Christmas Market at the Cologne Cathedral is the most impressive one in, due to the huge backdrop of the imposing Cathedral. Beneath the Cathedral and the largest Christmas tree in the Rhineland, you can find well over 160 festively designed wooden pavilions. Here you can watch artisans at work, enjoy original “Christmas Mulled Wine” out of festively decorated Christmas mugs or you can choose from an unlimited choice of sweets and local delicacies. The Alter Markt takes place in front of the old town hall only 200 meters from the cathedral. Shadowed by beautiful narrow-gabled houses and half-timbered stalls, this market conveys a very romantic and idyllic feel. The Neumarkt is Cologne’s oldest Christmas market located near St. Aspoteln’s (Basilica of the Holy Apostles) church. This market glows in splendor with charmingly designed chalets and a unique “stars at night” theme. The Christmas Market on the Rudolfplatz takes you to a world of brother’s Grimm fairy tales. Large fairy tale figures and festive illuminations provide a special eye-catcher, set against the historic backdrop of one of Cologne’s 3 standing medieval gate houses. You may very well be asking why we are talking about Christmas markets in May? Well because to see the markets you need to plan ahead. GetAway Travel has an agency exclusive offer for you to join us on an amazing River Cruise on the Rhine River during the start of Advent. 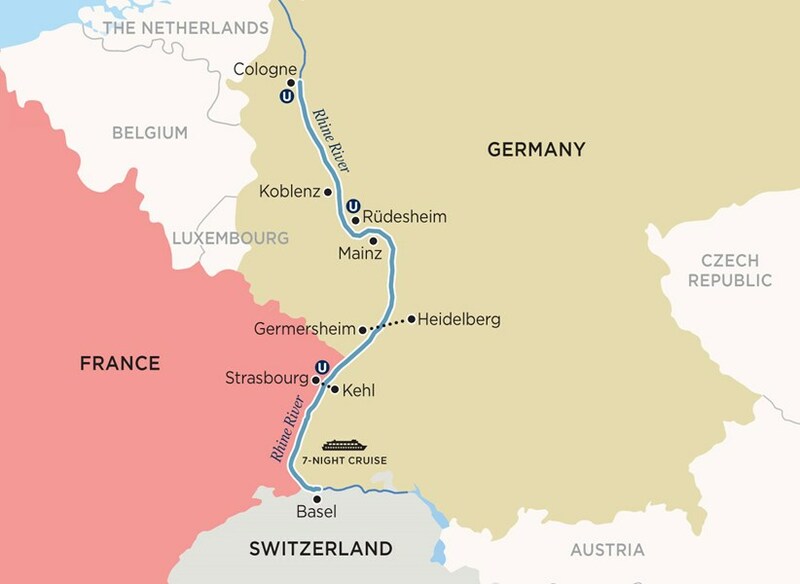 Prepare to be pampered and amazed on our special 7 day trip cruising along the legendary Rhine through Germany, France and Switzerland. Explore charming towns and discover treasures in some of Europe’s finest traditional Christmas markets. You’ll revel in the brilliant holiday decorations and in tasting the many treats and spiced wines of the season. This is truly the way to celebrate Christmas! Discover the roots of our Christmas traditions as you explore some of Europe’s most charming towns. Browse for unique ornaments in Basel’s Christmas Market. Sip vin chaud as you stroll to Place Kléber to behold the enormous, brilliantly lighted tree that Strasbourg offers modern celebrants. Find unexpected treasures in the red-roofed stalls clustered around Cologne’s magnificent cathedral. You may have never planned your Christmas holiday this far in advance, but now is really the time to get in the spirit and join our group. Please view our webpage for more details on this cruise and information on how you can sign up! Oh and did we mention that the river cruise is all-inclusive? This entry was posted in Cruising, Europe, Germany, Holidays, River Cruise, River Cruising, Wine and tagged Christmas, christmas market, Christmas Markets, Christmas tree, s.s. catherine, ss catherine, traditional Christmas markets, Uniworld on May 14, 2014 by Paul - GetAway Travel Service.